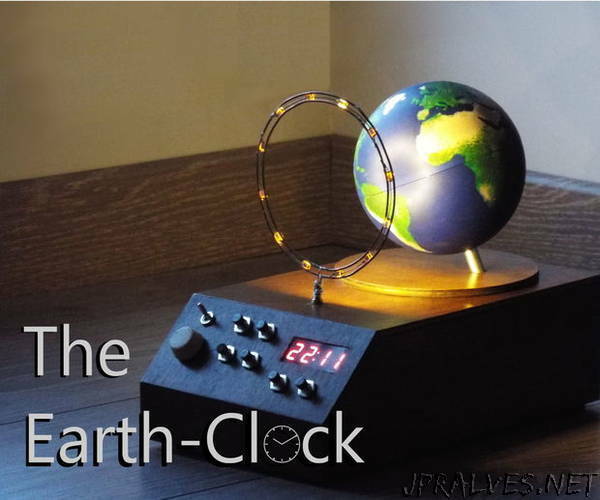 “The Earth Clock is a project I made in order to visualize the face of the earth exposed to the sun in real time! In the nature the sun-rays are almost parallels because the sun is far away, that is why the Earth is 50% in the light and 50% in the dark. The light source is complicated to make, because by using a simple LED (picture-1), light-rays won’t be parallels and the globe won’t well be lit, however if we use a light with the same diameter than the globe, the planet will be well lit (picture-2), I chose to make an LED ring with a diameter of 100mm (as my globe). I bought warm white SMD LED (3200K) and I made a ring from wire, I decided to use 12 LED so I drew a circle and marks to place them correctly.